We live on a fairly large ranch in south Texas and never leave the house unarmed. We have guns readily accessible in our house and work shops. 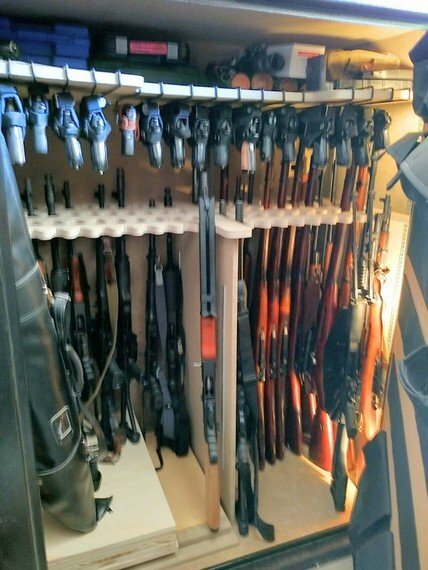 My wife’s Tahoe, my truck and side by side are always armed. This isn’t paranoia this is the world that we live in everyday. Most of my relatives and neighbors live this way yet not one of us has accidentally shot anyone. Guns are definitely dangerous but for us they are tools to be used and respected. Hopefully, the wall will be built soon, and you will be able to feel more secure. There was a Texas Rancher like you that gave a speech yesterday with Trump. The Rancher said the illegals cross his land every day. Says he goes everywhere armed. OK, so all-in, deaths inside hospitals are running at 32 times more than gun murders. I would think so since most folks who die in the hospital went there in grave condition to begin with. The entire thing raises the point, statistically we live in safe time. Room for improvement, but be glad you live in an advanced economy. I've been taken to OR three times. Docs freaked when I said no general, just regional for pain. But they did honor it. A general is very small risk, but why take an additional one in most cases. And the fact a limp body is easier for the staff to manage, and generals pay more, are not good reasons. 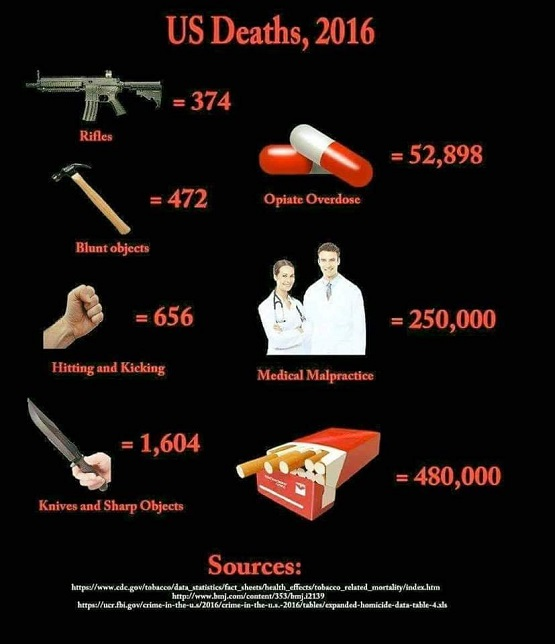 Here in the States, the stats i have read do not agree with what your are experiencing. In another thread last week it was discussed that with the exception of a few Democrat led large cities, gun deaths in the US are not very much. More people die in car crashes every day than are killed by guns. Well as the UK is still just about in Europe I can tell you that no one here is permitted to own a damn thing. Theres recently been 2 violent murders within hundreds of yards from my house here in sunny South London. In the news today were some details of a hit where the victim was mown down with an Uzi ! A flippin Uzi. So it seems criminals have all the guns they want but us normal citizens..can't even carry pepper spray ! ie: only the criminals have guns in those cities..
My question to you though, are those murders related to Islamic Terrorism ? It seems that most every London crime i read about lately is Islamic related. Where i live, we all have guns, and the criminals do not usually mess with us "normal" people. Most of the murders that occur are all "one criminal killing another criminal" type stuff. Usually what the police call "Black on Black" crime. ps: be happy you do not live in Tijuana Mexico, where over 1,200 were murdered last year due to drug cartel violence. No none of the murders mentioned have anything to do with Islamic Terrorism. One of the two close by were drug dealers who murdered an innocent man. The Uzi shooting was a 'professional' hit. Many others last year all gang related. Still makes your chances of been killed more and if you have a family they are far more in danger. 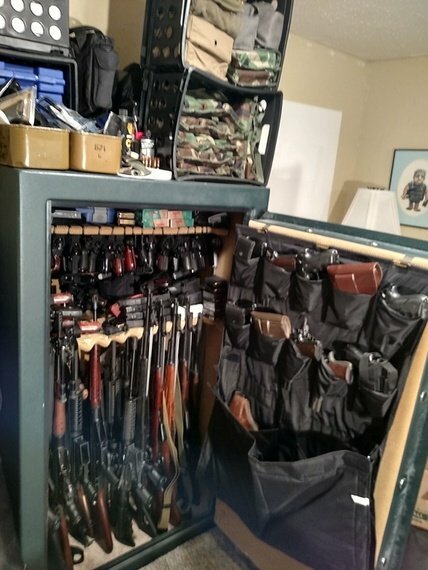 Actually I am just a typical American gun owner and hobbyist with a modest selection of firearms for sport and home defense.